Feliciano started this season as an 18 year old in the Midwest League Timber Rattlers after holding his own in the Rookie league last year. So far so good as he’s slashing .282/.358/.423 in 81 PA’s. Feliciano is very young for low A so I expect the Brewers will let him take his time to work behind the plate and not rush his advanced bat. Feliciano has the potential to be special. Cordell had a very nice spring training and slashed .282/.354/.480 in 31 PA’s but was sent to AAA Colorado Springs to start the year. He’s maintained the bat slashing .299/.360/.529 in 96 PA’s there. I saw him play in spring and he had the look of a major leaguer and hope to see him in Milwaukee before the end of the year. There was some talk of finding another position for him but all his time has been in OF so far this year. Webb made his professional debut this season as a 22 year old in the low A Midwest League. Webb has had two starts and five outings with 15.1 IP total. He’s shown some power with 18 K’s but is hittable and control has been an issue in the early going. Nice arm though so Milwaukee’s 2016 3rd round pick is still one to watch. Brewers moved Orimoloye to Midwest league. He’s near the league league with 5 HR but slashing .217/.278/.458 in 90 PA. 28 K’s suggests he a bit overwhelmed at the moment but Milwaukee will have plenty of patience with him due to his tools and athleticism. Burnes moved to high A Carolina after last year’s success at Wisconsin. He’s has continued to impress in his first 34 IP with a 1.32 ERA, 32 K’s and just 21 hits allowed. Carolina’s rotation is very exciting this season with Burnes, Ponce, Diplan, Peralta, Yamamoto, Medeiros and eventually Phil Bickford on the roster. Someone will have to move up to make room. While Burnes is not old for the league, only Ponce from this list is older, so Burnes is making a case. 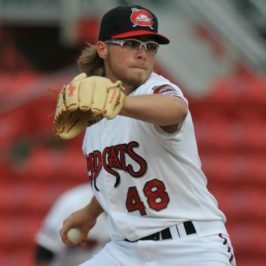 Burnes could move up Brewers prospect list this season. Peralta has seen innings as a starter and in the pen at high A Carolina. A team loaded with interesting arms Peralta will have to seek IP wherever he can get them. He’s already improved on his results from last season’s taste at the level with a 3.13 ERA in 23IP. He has 35 K’s and allowed just 15 hits in his limited appearances. Nothing to not like here so far from the 21 year old. Get this kids some glasses. After struggling mightily in the Midwest League last season (.240/.268/.391 in 524 PA’s) Gatewood had his vision checked in the off-season and got some prescription contacts. Then he was promoted to start 2017 in high A Carolina despite a lack of professional success. So far so good, to the tune of a .333/.439/.583 slash line in 96 PA’s. He has K’d 32 times but he’s taken 18 BB’s in 27 games this year after having 18 BB’s in all 126 games last season! Also worth noting is that Gatewood is playing 1B this season so the bat, specifically the power, will have to continue to develop. He’s always had the raw power and the likelihood of tapping it improves if he can sustain the newfound plate discipline. Very exciting progress here so far. Taylor was expected to move to AAA despite two poor seasons in AA Biloxi. His start there is delayed as he deals with an oblique injury. He’s still not started the season. Back to AA Biloxi, Perrin will continue to see if his control can overcome his lack of stuff at the higher levels of minor league ball. He’s been OK so far in his 22.2 IP with 27 K’s vs. 7 BB, but has been a bit more hittable than usual at 10.3 H9. With bigger names like Luis Ortiz and Jorge Lopez in Biloxi this 27th rounder will have to continue his success to get attention in the organization. After not pitching at all in spring training, Wang is back in Colorado Springs throwing 10.2 low leverage short relief innings to this point. Doesn’t look as if Brewers are looking to Wang as a starting option any more.